The bulk price start at 2+,the system will give the discount price automatically,order more,discount more. The Banana Pro (Banana Pi) is a credit card-sized and low-power single-board computer developed in China, with the intention of promoting the STEAM (science, technology, engineering, art and mathematics) education in schools. The Banana Pro has an Allwinner A20 system on a chip (SoC),which includes an ARM Cortex-A7 Dual-core (ARMv7-A) 1 GHz,Mali400 MP2 GPU, and with 1GB DDR3 SDRAM. It uses a microSD card for booting OS and also has a SATA 2.0 interface for connecting a hard disk to get more storage space. 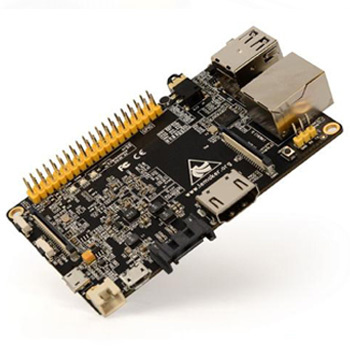 Compared to the Banana Pi, the Banana Pro adds an on-board WiFi 802.11 b/g/n rtl8189es and integrated composite video and audio output into a 3.5mm TRRS jack to get more space for making 40 pins extension headers. Copyright © 2006-2015 Eleduino Technology Co.,Ltd All Rights Reserved.